It's taken me a while to get back in the swing of things lately. I feel like I've done very little in the way of quilting the past couple months. I thought the best way to get back into the thick of things was to work on a scrap project I started back in July. My Clammed Out & Scrap Magic post talks about what to do with scraps from a previous quilt. If the fabrics and color seems familiar, they are! They all came from the infamous Glam Clam quilt I recently finished. 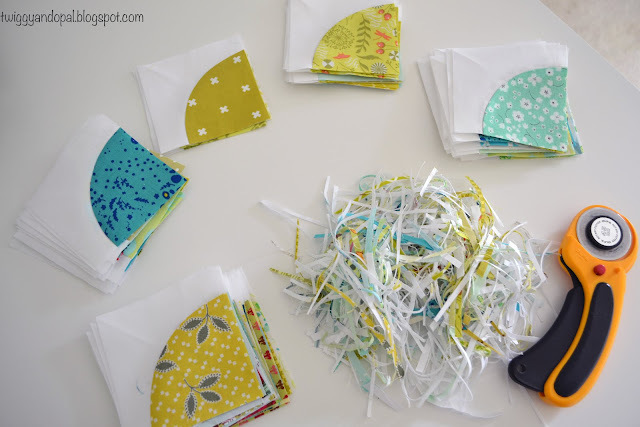 So many scraps! While cutting out the Clams for the Glam Clam, I was left with a ton of scraps. It seemed like the perfect time to make some drunkards path blocks. I had a tub full that I glue basted and quickly set about chain piecing those pesky curves. Except...they really weren't that pesky to sew! I choose to glue baste the curves to save myself from getting frustrated, and so I could put the pedal to the metal while chain piecing. It seemed like a great idea...and it was! 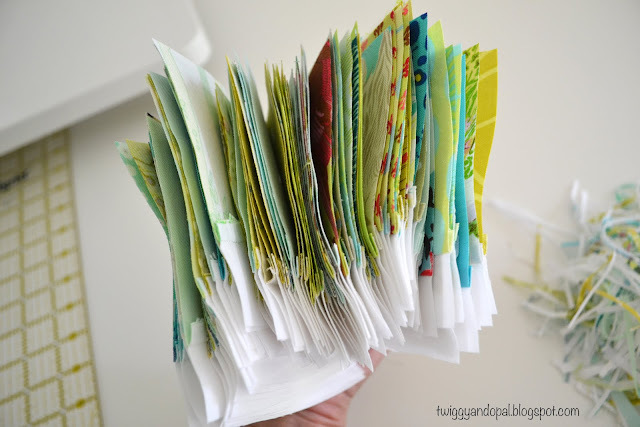 I marked the center by folding and pressing a crease in each piece. Here, I marked it with pen so you can see it better. 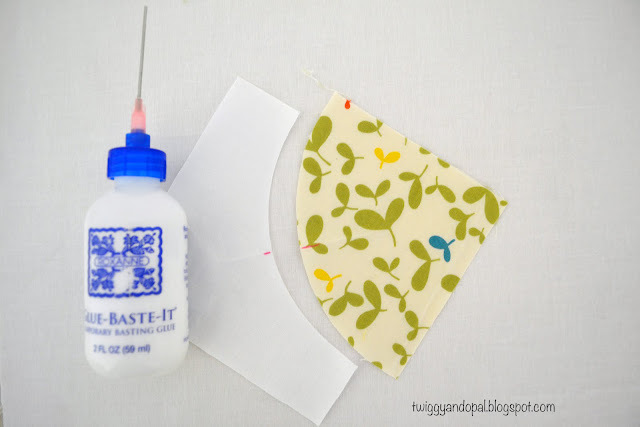 A small bead of glue goes a long way! It doesn't take much to hold the two pieces together. I line up the center point and with the tip of the dry iron I slowly move the top piece around the curve. It doesn't take long for the glue to set. Repeat the same process for the other half. Before you know it...it's done! 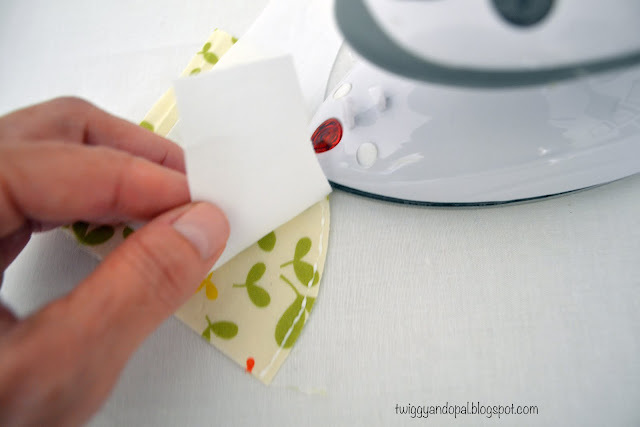 There is a little fussing that has to be done when attaching the two pieces, like holding the top piece out of the glue when setting the glue with the iron. Its worth it to me! 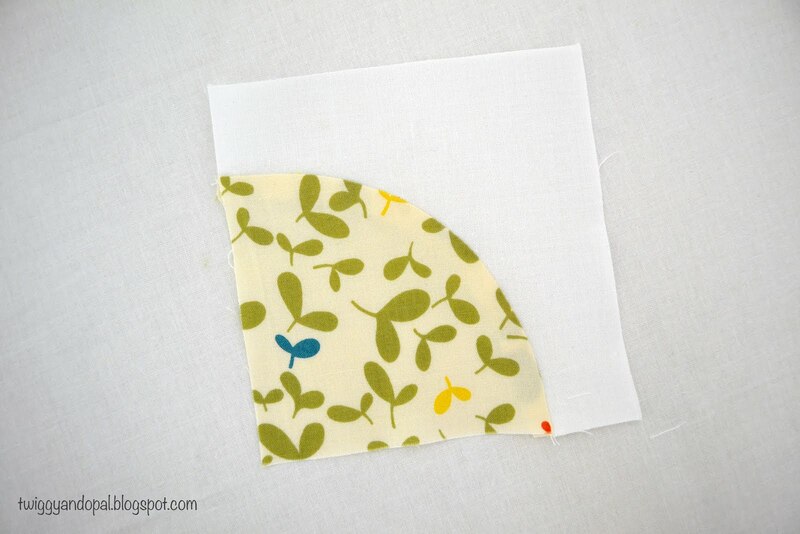 Usually when making this block I would press the seams towards the white. This time I pressed towards the print. I didn't want the print to be seen through the white, which happens when you are doing just about any block. I did a lot of trimming so my blocks were good and square. These ended up being 4". I'd like to say they stayed that size! They did not! I wasn't terribly consistent with perfection when I slapped these together! When I put four blocks together they were a little askew! I was only concentrating on lining up the curves for one big circle. After assembly, I trimmed all the blocks to 7". Now that's something I can work with! I've played with several layouts since making the blocks, and even had to make more. The top layout is a possibility, but this last one is not. In order to do that one I would of had to sew each row together and hope all the seams lined up. 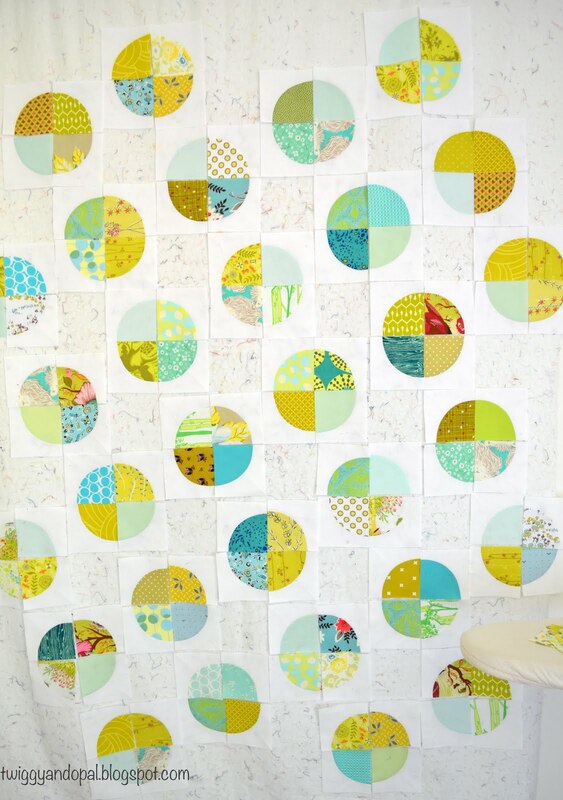 I love the layout and know that one day...it to shall become a quilt! A year ago I never would have thought glue could be so helpful in quilting! I loved using it for these little Drunkard Path blocks! It certainly made everything easier for me! I use glue basting a lot no pesky pins to worry about. I like the bottom layout best I think with a plain white block inserted in the spaces this quilt would have a nice flow. I did like the bottom one as well, but ended up not going with it! 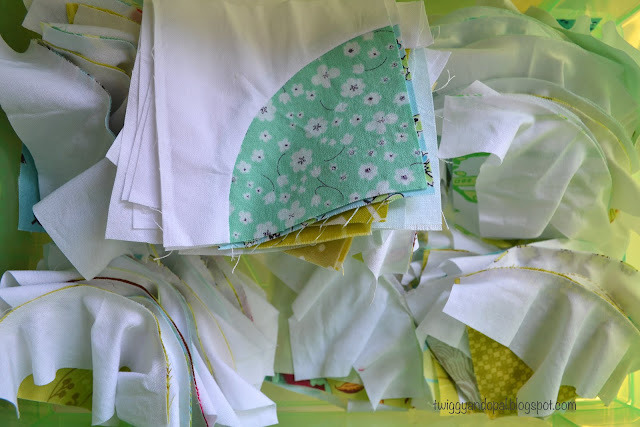 My concern was I wouldn’t be able to match up the blocks when sewing the rows together! I have a new layout I’m going with! I love glue basting!! I wanted to make one for a long time too! One more to cross off my list. You can use regular washable Elmer’s School Glue for basting. Just don’t open the top all the way so you can get a thin bead of glue when applying it! I'm glad you have found some time and creative energy again, Jayne. The glue basting looks like it works perfectly for you. I love that feeling of finding a technique that works well. I look forward to watching this one evolve for you. Well Done. I know what you mean about losing your sewing mojo. I am finishing a quilt for my cousin, which is helpful to get back to the sewing machine. I had spine surgery in June, and can only now sit for short periods of time at my machine. Fortunately, I could work on some hand embroidery. 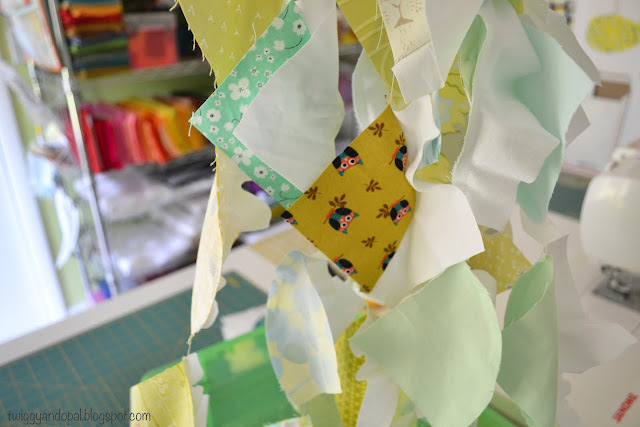 What you made with those scraps and glue is so pretty and has a lighthearted feeling. I look forward to the final reveal. It may seem to you that you've been out off your game lately, but to me you have been posting creative quilt inspiration right along! I also glue baste EVERTHING. With Elmer's glue. And no fancy top on it. It's works like a charm, especially when I'm worried about lining up seams for blocks that aren't "quite right". Thanks for showing me it works with curves too! I’m trying to stay in the loop with blogging! So, I try and post projects that have lingered or projects that I’m working on. I also use straight Elmer’s glue too! I’m pretty sure the glue in the fancy bottle with the fancy tip is the same thing! Both work and both have made my life so much better! I’ve really never tried glue basting seams to make sure they match up…that may be next! I never thought to use glue basting for curved sewing! I'll have to try that. I've got a bunch of full circle pieces I want to set in, so it will be interesting to try different methods. Glue basting for the win! Great scrap project. This is going to be beautiful! And I'm glad you've found your mojo again! I HAVE to try this technique. I shy away from sewing curves but you sure made it sound easy. Love your blocks! Thanks for showing us the glue basting, Jayne! I will have to try it. I love the colors in your blocks! I will have to remember to try glue basting if I ever get brave to try my drunkard path templates again. I can see it worked great for you. But that last one is an awesome layout!!! 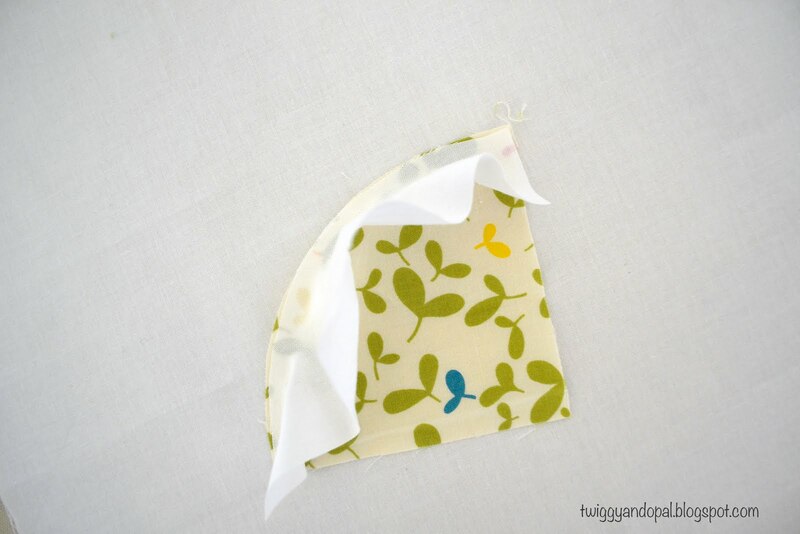 Great job on finding a great solution to your piecing. Thanks for the tip on the glue. Lovely blocks. I learned something new today which I love since I seem to avoid curves and zippers. I just happen to have a jug of school glue on my shelf so there's no excuse for me not to try curves now. I do like the layout of the top quilt and can understand why you don't want to sew the blocks row by row. I would do the same thing. I think you got your mojo back with this quilt; can't wait to see what you decide to do. I ended up going with the first layout because it was easier, but I love the second one more. Sometimes easy is the best route to take! These blocks are wonderful, Jayne! Such a great scrappy feel! Some day I know I am going to want to tackle curves and circles, so I saved yet another one of your posts! I love how these blocks look. I appreciated the tip about glue basting which I tried once when I was binding and decided pins or clips worked better, but with curves I could see it being very useful. Take care, Mary. 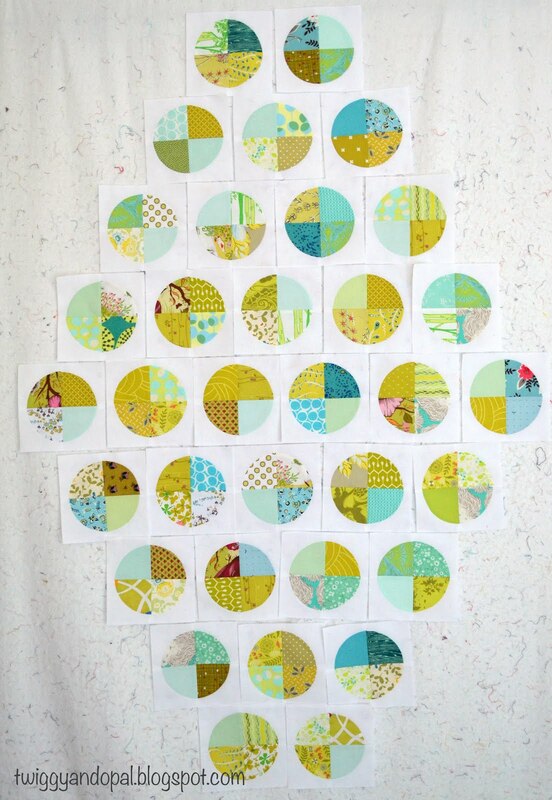 I have been thinking of a circle quilt for a while , had a few ideas on my head . I hadn't thought about the lining up if all the actual blocks , just the circles . More to ponder ! Love your glue basting photos! So clear and easy to understand. Great job using some beautiful leftover scraps!!! Oh that is really cute!! A great project to get your mojo back! Love the circles and I really love how you basted them too. I'm thinking about circles again, I know I haven't finished quilting the last one yet but They aren't out of my system yet and I need a hand project. On the other hand I do like how you made yours and you never know it may help me to get one finished. You have had so much to deal with, it is understandable you might not have found much time for sewing. Hoping you are doing well and life is calming down for you. I have not glue basted but it looks like a really good tool to add to the list of things to try! Very fun blocks. I've never glue prepped anything before, but can see that would be a great advantage for a few blocks. Love all the settings for those blocks. It's always so hard to pick just one. Pretty darn fabulous! You may have just inspired me to try this! Love every sliver, every step and the final outcome. smart woman! I might have missed it but you are stitching the seam after gluing correct? 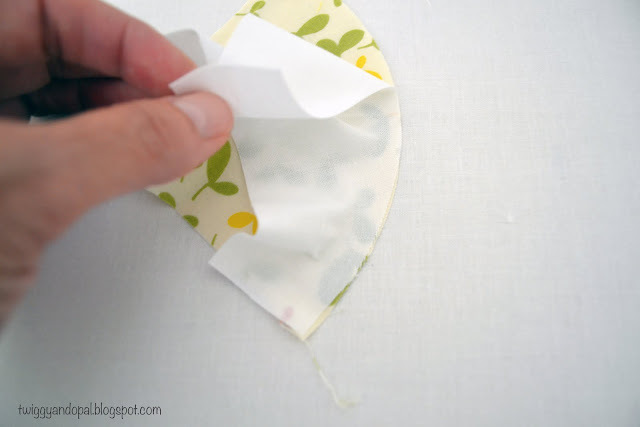 This is how I insert whole circles, glue seams then stitch. Love the design too. I'm glad to see you are back to sewing again after such a difficult time. 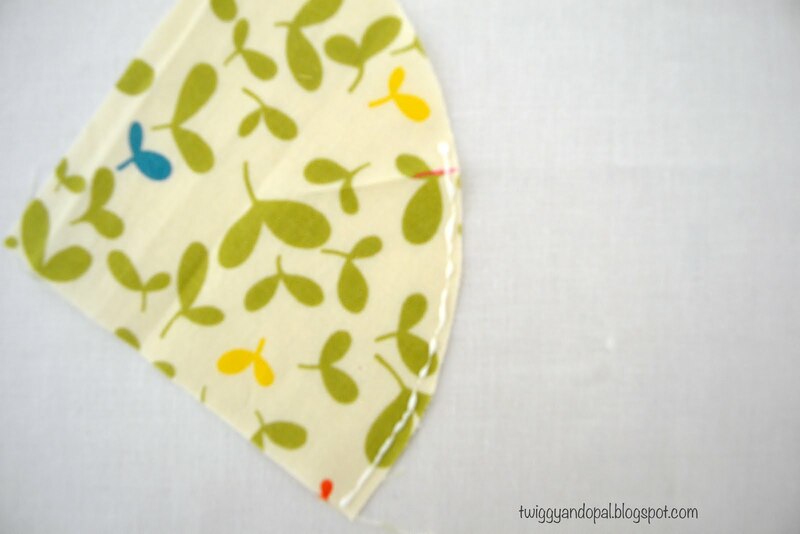 I believe that even though it's tough to start again, sewing--or any creative passion--is therapeutic. I'm quite a mess maker and have been afraid to try glue basting, but you make it look so neat! Does it wash out easily or do you need to do an extra soak or rinse?